as excess, as autonomous, as impersonal, as the ineffable, as the ongoingness of process, as pedagogic-aesthetic, as virtual, as shareable (mimetic), as sticky, as collective, as contingency, as threshold or conversion point, as immanence of potential (futurity), as the open, as a vibrant incoherence that circulates about zones of cliché and convention, as the gathering place of accumulative dispositions (9). Their inventory doubles as a litany, not without its patron saint: Baruch Spinoza. Indeed, the often-cited phrase from Spinoza’s Ethics (Book III, Proposition 2, Scholium) serves as a maxim for this cadre of writers: “nobody as yet has determined the limits of the body’s capabilities: that is, nobody as yet has learned from experience what the body can and cannot do” (Spinoza 280). 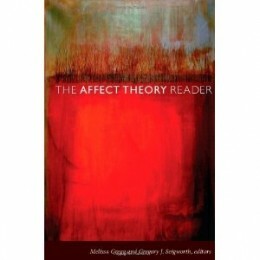 The Affect Theory Reader, a collection of original essays, answers Spinoza’s challenge with great aplomb; the focus on affect enables contributors to probe the limits and capacities of situations, to produce more dynamic descriptions and prognoses, freed from the constraints of subjective and identitarian politics. In this sense, The Affect Theory Reader registers the critical highlights of the recent “affective turn.” It serves as an apt companion to book-length studies by several key contributors—namely, Brian Massumi’s Parables for the Virtual: Movement, Affect, Sensation (2002), Lauren Berlant’s The Female Complaint: The Unfinished Business of Sentimentality in American Culture (2008), Sara Ahmed’s The Cultural Politics of Emotion (2004), and Patricia Ticineto Clough’s earlier edited collection The Affective Turn: Theorizing the Social (with Jean Halley, 2007). Yet, despite the increase in the number of publications dealing specifically with affect in the past fifteen years, there has been no single work of this kind to treat the cross-disciplinary purchase of affect. The great value of The Affect Theory Reader is its ambition to bring together the most vocal proponents of this declaredly-new field in order to showcase scholarship that continues to negotiate the provinces and definitions of affect, but which takes these debates as a crucible for politics and philosophy. Many essays in the collection use affect and the theoretical tools afforded by the affective turn to develop approaches to experience: questioning both the meaning of experience and the ways it might remain, or cease to be, a useful category of anthropological investigation. Specific affects are indices of experience, attempting to describe the sense of the world in detail, with sharper attention to the rich lived realities of seemingly sterile concepts. Ahmed, in “Happy Objects,” defines affect as “what sticks, or what sustains or preserves the connections between ideas, values, and objects”—a determination which confronts “the messiness of the experiential, the unfolding of bodies into worlds, and the drama of contingency, how we are touched by what we are near” (29, 30). In “Writing Shame,” Elspeth Probyn praises Primo Levi’s writing on shame insofar as he “challenges the current practice of writing about affects and emotion in a generalized and abstract way” (89); here, in contrast, the affect of shame enables a more thorough and nuanced approach to experience and subjectivity. For these writers, following Spinoza, affect points to the priority of experience, the extent to which concepts like identity and person take and lose shape in experience. Affect is impersonal, the very stuff of experience; it is prior to both subjectivity and objectivity. This is Berlant’s focus in “Cruel Optimism,” where affect mediates between identity and desire, enabling a more pointed understanding of the labor of subjectivity, the tiring work of “life-building” (112). Contributors seem to write in concert, coming together to wrest affect studies from abstraction, to situate affect and to demonstrate the utility of affect studies for precise investigation and (to borrow a phrase from an earlier milieu) thick description. In “Eff the Ineffable: Affect, Somatic Management, and Mental Health Service Users,” Steven D. Brown and Ian Tucker pursue this further, taking the heralds of the affective turn to task for their inability to address the demands of social scientists. Against such theorists as Gilles Deleuze and Massumi (and, by extension, most of their fellow contributors), Brown and Tucker affirm a determination of affect that is more interested in subjectivity and its vicissitudes than in some abstract “experience beyond subjectivity” (249). The Affect Theory Reader is in these respects a very valuable resource: it presents essays in conversation in such a way as to provoke further discussion, to hone various definitions and approaches to affect. Gregg and Seigworth frame the conversations in such a way as to draw out the differences between approaches, and their substantial introduction serves as an apt survey of current work. But there are more similarities across the essays than the Reader might immediately lead one to believe. While Gregg and Seigworth have assembled an outstanding collection of essays, the “Reader” in the title Affect Theory Reader is potentially misleading. Generally, one expects a reader to introduce a field and to survey current work—in this case, across disciplines. Here, we encounter a limited sample of conversations, mostly taking shape around a select group of thinkers: Spinoza, Deleuze, Massumi, Félix Guattari, Eve Kosofsky Sedgwick, and Silvan Tomkins. Massumi, for instance, contributes more than an essay to The Affect Theory Reader. His name and work are ubiquitous across the collection, particularly the announcement in his Parables for the Virtual that “Affect, like thought or reflection, could be extended to any or every level [of investigation], providing that the uniqueness of its functioning on that level is taken into account” (Massumi 37). Massumi heralds, after Spinoza, the autonomy of affect. This is neither a fault nor a liability—on the contrary, this particular approach to affect reflects the most advanced work done in the nascent field of affect theory, or affect studies. Save for Brown and Tucker (and, for a brief moment, Lawrence Grossberg, to whom I turn momentarily), The Affect Theory Reader registers a consensus. The majority of contributors follow Massumi and trace affect as a force in a political economy of bodies and becomings, affirming the degree to which “thought’s approach cannot be phenomenological [but] must be unabashedly metaphysical” (66). This is Clough’s ambit in “The Affective Turn: Political Economy, Biomedia, and Bodies,” where Massumi’s chief interlocutors—Spinoza, Deleuze, Guattari, and Henri Bergson, all of whom recognize the economy of affect as a metaphysics—inform her detailed historical treatment of biopolitics through an invigorating study of the affective dimensions of the passage from formal to real subsumption in late capitalism. This is quite exciting, a real advancement in the use of affect in contemporary Marxism and political economy, and both Clough and the editors do well to serve the reader with essays of this quality and ingenuity. It is worth reminding the reader, however, that her work is as much in conversation with the archive of concepts and authors showcased in The Affect Theory Reader as it is with Marxist and feminist studies of affect that stand outside of the scope of the collection—for instance, Michael Perelman’s The Invention of Capitalism: Classical Political Economy and the Secret History of Primitive Accumulation (2000), J. K. Gibson-Graham’s Postcapitalist Politics (2006), Ann Cvetkovich’s An Archive of Feelings: Trauma, Sexuality, and Lesbian Public Cultures (2003), or, more generally, the work of Raymond Williams, Michèlle Barrett, and a lost generation of theorists which Lawrence Grossberg addresses in the splendid interview “Affect’s Future: Rediscovering the Virtual in the Actual.” The Affect Theory Reader, however excellent, is less a survey of approaches and definitions as it is a concentrated effort, presenting a particular approach to affect, albeit from a number of standpoints. While I personally find the collection stronger for this focus, whether or not this is ultimately effective depends upon the reader’s expectations and the degree to which one is aware of the larger set of conversations on affect occurring across disciplines, many of which are not represented in the present collection. While many will concur with Massumi’s scepticism of quantitative research in its inability to attend to the particular, we are left with a riddle-like description of affect as something scientists can detect the loss of (in the anomaly), social scientists and cultural critics cannot interpret, but philosophers can imagine … How then can we engage affect in light of the critical projects we are engaged in, or are we to abandon the social sciences entirely? In fact, both Massumi and Sedgwick are advocating a new academic attitude rather than a new method, an attitude or faith in something other than the social and cultural, a faith in the wonders that might emerge if we were not so attached to pragmatic negativity (Hemmings 563). In the spirit of these questions, and despite the declared impossibility of any single, generalizable theory of affect, The Affect Theory Reader does present a controlled sample of cross-disciplinary work on the subject. Save for several bibliographical references and a handful of exempla, psychoanalysis is virtually absent from the collection—a frustrating lacuna given its rich archive of affects and theories of affect, from Sigmund Freud and Joseph Breuer (at the dawn of psychoanalysis) to André Green, Jacques Lacan, Adam Phillips, and Paul Verhaeghe. Psychology and psychiatry receive only marginally more attention. In 1995 Eve Kosofsky Sedgwick and Adam Frank proposed the work of psychologist Silvan Tomkins as an alternative to the psychoanalytic preoccupations and pieties of their contemporaries; here, in The Affect Theory Reader, Tomkins is cited more often than Freud and with more authority on affects and their vicissitudes. While this is not necessarily wrong (I am certainly not arguing here for a particular mode or pedigree of psychoanalysis) it would be helpful to see how we arrived at this point. On this the editors and contributors alike are silent, eschewing Sedgwick and Frank’s thoughtful and stimulating question, “What does it mean to fall in love with a writer?” as well as their call to read Tomkins with Freud, to curate new histories and archives of affect as well as new applications (Sedgwick and Frank 23). Where the absence of psychoanalysis is puzzling, the absence of feminist psychoanalysis from the collection deserves a harder look. Take, for instance, Julia Kristeva; both Powers of Horror: An Essay on Abjection (1980) and Tales of Love (1983) oriented the work of two generations of scholars, laying bare the intersections between affect, feminist theory and political praxis.And just as feminist thinkers like Kristeva disappear from the archive of affect theory, so do their interlocutors. Consider the important chapter from Tales of Love on Bernard of Clairvaux (“Ego Affectus Est. Bernard of Clairvaux: Affect, Desire, Love”), where Kristeva mines nonmodern archives to complicate contemporary assumptions about affects and their provinces (Kristeva, 151-169). Bernard’s writing affords Kristeva insight into later, psychoanalytic distinctions between love and desire and, in turn, enables a more thorough historical approach to modern subjectivity via nonmodern approaches to affect. There is no such work in The Affect Theory Reader. Not only are feminist psychoanalysis and feminism under-represented, the collection is distinctly presentist. Except for the frequent citation of Spinoza, there is scarcely a reference to any writer or event prior to the twentieth century. This risks losing sight of the development of alternative theories and approaches to affect that have marked much of Western and Eastern—indeed, World—philosophy, aesthetics (in the broadest sense), religion, and therapeutic discourses. Again, this is only a critique of The Affect Studies Reader insofar as one might expect a comprehensive and exhaustive survey of approaches to and definitions of affect and affect theory—an impossible task, both practically and theoretically. Gregg and Seigworth have assembled an impressive collection of essays and, in their introduction, certainly recognize the limits and scope of such a project. The work is impressive and will certainly catalyze further development in affect theory across disciplines. My hope is that it will also generate due responses from the exurbs and catacombs of affect theory, calling for revised histories of affect and its cross-disciplinary purchase—and, ultimately, making good on Gregg and Seigworth’s insightful promise that affect will never be reduced to a single narrative, archive, or theory, the auto-critical promise that marks the highest quality of The Affect Theory Reader. Kathleen Stewart’s “Worlding Refrains” does enter into implicit conversation with Cvetkovich’s wonderful book, but one wishes for a more direct engagement with An Archive of Feelings by many of the other contributors. This other history of affect informs his own important collection Marxism and the Interpretation of Culture (edited with Cary Nelson, 1988). Hemmings, Clare. “Invoking Affect: Cultural Theory and the Ontological Turn.” Cultural Studies 19.5 (September 2005): 548-567. Print. Kristeva, Julia. Tales of Love. Trans. Leon S. Roudinez. New York: Columbia University Press, 1987. Print. Massumi, Brian. Parables for the Virtual: Movement, Affect, Sensation. Durham, North Carolina and London: Duke University Press, 2002. Print. Rancière, Jacques. The Politics of Aesthetics. Trans. Gabriel Rockhill. London and New York: Continuum, 2004. Print. Spinoza, Benedictus de. Spinoza: Complete Works. Ed. Michael L. Morgan. Trans. Samuel Shirley. Indianapolis, Indiana and Cambridge: Hackett, 2002. Print. Tomkins, Silvan. Shame and Its Sisters: A Silvan Tomkins Reader. Ed. Eve Kosofsky Sedgwick and Adam Frank. Durham, North Carolina and London: Duke University Press, 1995. Print. Russ Leo is a Perkins-Cotsen Postdoctoral Fellow in the Society of Fellows at Princeton University. As of Fall 2012 he will be an Assistant Professor in the Department of English at Princeton University. He is writing a book, tentatively titled Reformation Tragedy: Affect and the Poetic Foundations of the Reformation in Early Modern England, which attends to the ascendency of tragedy as the prime poetic form in Northern Europe together with the emergence of a precise autonomous determination of affect. Treating the philosophical writing of Jean Calvin and Baruch Spinoza as well as the work of tragedians William Shakespeare, John Milton, and Fulke Greville, Leo traces the prehistory of Spinoza’s autonomous theory of affect, an approach that endures to our contemporary occasion in a number of permutations. Leo is also currently at work on a series of articles on affect and its purchase in contemporary Marxist and psychoanalytic debates.